Iridology is the science and practice of eye analysis revealing a person’s relative state of health. The study of the iris provides information on genetic predispositions, inflammation, toxicity and stresses, providing clues to potential health problems. Iridologists examine the iris pattern, or structure as well as specific signs, color, and the overall composition which is a genetic blueprint much like that of a fingerpriint, giving information about the predispositions of one’s health. This allows us to take precautions or make suggestions for possible ways of preventing health issues from manifesting. An Iridology assessment is an important first step in your natural health program. It reveals potential genetic predispositions to weakness in the organs and systems of the body. It gives new insight as to the stresses, toxicities, and potential imbalances that may have occurred in the past, occur in the present or may potentially occur in the future. Consultations include a full iris analysis, along with recommendations and an individualized specialized health program. Once you have booked a consultation, you will be asked to email two photos of your eyes whereby each eye fills the photo frame and we will perform the analysis and health program via Long Distance. Georgina Cyr is certified by the International Iridology Practitioners Association. 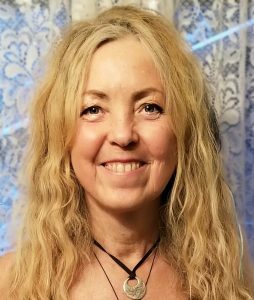 She has taught Iridology Courses for Langara College in Vancouver, British Columbia, Canada, and on Vancouver Island at Windsong School of Healing. She has also taught Iridology to Naturopaths for Wellness Centers such as Verita Advanced Wellness Center in Singapore. She continues to teach at various Colleges and Schools. "Such an illuminating teacher, guide and spirit Ms. Georgina Cyr is! One of the best teachers I have ever come across, a truly empathic and caring human being. This course is spellbinding in its display of information. You'll never look into someone's eyes again the same way after this course. The iris is a fascinating world !!!!!!!" “Georgina was very pleasant and knowledgeable. I was especially impressed with her diplomacy and patience." “Georgina was excellent, very clear in explaining. I feel confident with the information. I would recommend Georgina to others confidently."